"In both pleasant and unsettling ways, companies are quickly learning their brand equity and credibility is the sum total, and composition of their search results. They're also beginning to internalize (usually the hard way) that CGM is now the fastest-growing source of indexed content in search results....That means, in essence, we're all hostage to the conversation." 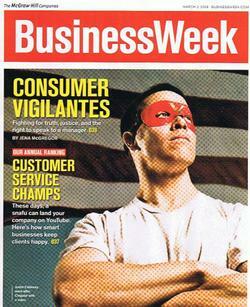 This issue is a key theme in my upcoming book, and it powers one of my "six drivers of brand credibility" -- affirmation. Brand credibility and reputation heavily rests on how well search results "affirm" brand attributes. For example, after hearing a "we solve all your problems" ad pitch from a particular brand, a consumer might conduct a bit of extra due diligence on a search engine, or even Wikipedia. In some categories such as wireless, search results often "affirm" negative -- not positive -- experiences with the brand, hence eroding credibility. Every brand stakeholder needs to be attentive to these dynamics. Again, here's the article. If you want to dig deeper, John Battelle, not surprisingly, has written a fair amount about this topic. What an incredible year to watch and learn from CEO-level behavior in times of crisis and difficulty. First we had Jet Blue, faced with an impossibly difficult situation, take to the airwaves on YouTube, apologize profusely, and announce a new passenger bill of rights. While Menu Foods practically hid their CEO during the pet recall issue, Mattel put their CEO, Bob Eckert, on the website video airwaves to nurture trust and confidence in the wake of the toy recall (a still-in-progress case study). Now we have Steve Jobs, who just wrote and posted the most remarkable letter in response to concerns about iPhone’s recent price decrease. He coupled an apology with a $100 Apple credit for all early-buyers of the iPhone. This is classic Defensive Branding. I predict it will be one of the most discussed, debated, and linked-to letters of the year, and so far I've already counted over 800 unique blog postings referencing his letter since 6 PM last night. I'd thought I'd dissect the letter, and draw out key "takeaways." I have received hundreds of emails from iPhone customers who are upset about Apple dropping the price of iPhone by $200 two months after it went on sale. 1. The Power of Listening: He read his mail, and he understands the core issue. Most CEOs wait for the formal report from the consumer affairs department. After reading every one of these emails, I have some observations and conclusions. 2. The Power of Responsiveness He has listened, and now he is responding. 3. The Power of Restating the Rationale: He’s re-affirming excitement around the product, as well as rationalizing Apple’s core decision to lower iPhone price. He’s doing so confidently and rationally, and as a build up to his eventual apology. Second, being in technology for 30+ years I can attest to the fact that the technology road is bumpy. There is always change and improvement, and there is always someone who bought a product before a particular cutoff date and misses the new price or the new operating system or the new whatever. This is life in the technology lane. If you always wait for the next price cut or to buy the new improved model, you'll never buy any technology product because there is always something better and less expensive on the horizon. 4. The Power of Empathy: Jobs is attempting to show empathy and understanding for those who have a tendency to buy products as soon as they hit the market. These are the coveted early adopters and enthusiasts, and they represent to sweet spot of the “new” marketing. These are also the same consumers who ranted to loudest when Job's announced, barely 24 hours earlier, a 33% price slash. They are the influentials. The good news is that if you buy products from companies that support them well, like Apple tries to do, you will receive years of useful and satisfying service from them even as newer models are introduced. Third, even though we are making the right decision to lower the price of iPhone, and even though the technology road is bumpy, we need to do a better job taking care of our early iPhone customers as we aggressively go after new ones with a lower price. 6. The Power of Accountability: In essence he’s taking accountability for not being sufficiently sensitive to these coveted early customers. He's also expressing resolve to right the wrong. Key message: we can't afford to lose you! Our early customers trusted us, and we must live up to that trust with our actions in moments like these. 7. The Power of Nurturing Trust: Job's is openly underscoring the undeniable role of trust in the relationship between the brand and the consumer. Indeed, trust is what makes the world go around, and it’s one of most important drivers of credibility. 8. The Power of Walking the Talk! Jobs is putting a real, tangible value on consumer value. If you were there for us early on, we will credit you $100. Details are still being worked out and will be posted on Apple's website next week. Stay tuned. 10. The Power of Forgiveness: In the end, he is offering a sincere apology, but also advertising the degree to which Apple consumers expect and demand more. In essence, his apology is reaffirming the power of the Apple brand. Here it's also important to note that saying you are sorry is a "consumer bonding" moment. It cements emotional connections. Let's keep this case study alive. And to that point, what promises to be an excellent thread has just started on WOMMA's Facebook thread. My very smart WOMMA colleague Rick Murray of Edelman has fired off the first comment, suggesting that "entire episode was avoidable had Mr. Jobs done one thing: reach out to and listen to his most ardent fans. Well, you read about it here first, but I dedicated this morning's lead ClickZ article (Keeping Trust During a Crisis) to a more extended discussion about the use of video in crisis communication. Mattel, J&J, and Menu Foods are cited. In terms of "actionability," I suggest that brands should "aggressively think about how to leverage interactive capabilities and platforms, especially video, to drive deeper emotional connections and trust with consumers." Tough situations, I add, are the best place to start. Video response within site search results. Brands have a long way to go in shoring up basic site search, but one opportunity is to use video-based responses against the query. If a consumer types in "ford safety," the results page should link directly to a trusted voice from the brand walking through the company's commitment to safety. It doesn't need to be the CEO; it could be the product manager or some other trust figure. FAQ databases. Similarly, FAQ databases should make better use of video responses. Right now, virtually all FAQ databases on corporate sites are grounded in text. Feedback forms. Should every feedback form or "contact us" link have a video of the head of customer relations talking about how sincere she is about getting the forms back? Think about how the Kashi brand conveys a "we're listening" mindset. External search. If consumers type in a directionally negative term on the major search engines, brands should buy text ads that link directly to a video response.